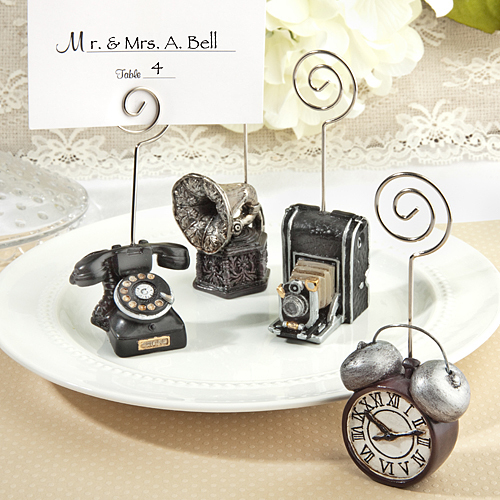 Each vintage icon place card holder measures approximately 4” tall x 1 3/4” wide. Classic rotary telephone - just like grandma used to use! Traditional film camera - to make your event picture perfect! Old style phonograph with silver horn speaker - will be music to their ears! Old school alarm clock - lets them know when to get the party started! Silver metal wire holder with coiled top for easy insertion of place card, photo or note. Bulk packed with blank place cards included.